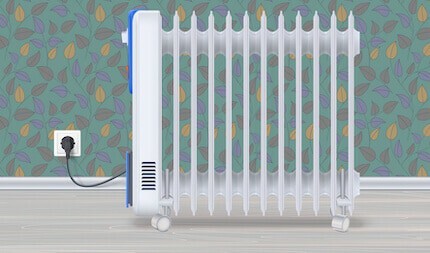 Home » Heaters » How does an Oil-Filled Heater Work? Are you thinking of buying a new heater for your home but aren’t sure which is best? Knowing how an oil heater works could help you to make a more informed decision. Oil-filled heaters are very popular. 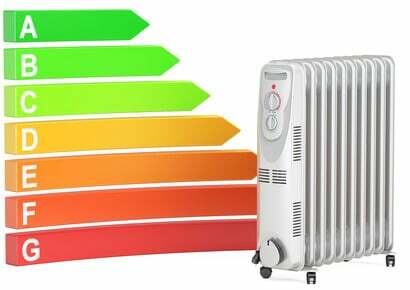 In fact, when it comes to space heaters, oil radiators are a top choice thanks to their safety, energy efficiency and effectiveness. So, why are these compact heaters a good choice for your home? Here we look at how an oil heater works so you can make an informed decision about whether to invest in one this winter. How does Diathermic Oil Work? Why Choose an Oil-Filled Heater? 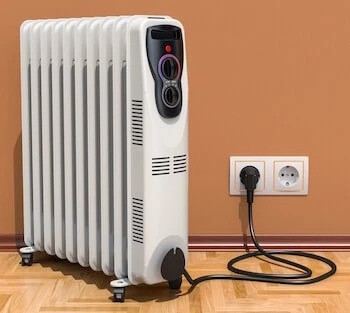 Oil filled heaters look similar to old-school radiators but they’re smaller in size. They are made up of a set of joined fins or columns. Sometimes, they will have open spaces in between the columns or fins which will be attached to a base with a control panel in front. Some oil heaters are flat panels, but this is unusual. Unlike traditional radiators, oil-filled heaters are mobile. They are connected to the household electrical system via a standard wall socket, so they’re able to be moved about to any room where extra warmth is required. Many even feature carry handles, although large models will usually feature wheels to allow them to be repositioned easily. Don’t miss our big guide to the top oil-filled heaters on the market right now! Inside the fins and body of oil heaters, you’ll find diathermic oil. This oil won’t need to be refilled since the oil isn’t actually used as a form of fuel. Instead, the oil is there to be a heat reservoir so it will never be used up. Rather, it continues to circulate through your heater. The electricity will be channeled into the resistor in the heater. This will turn the energy from the electricity into heat. The heat will then be absorbed by the oil inside the heater. The oil will start to warm up and circulate through the columns and fins. The heat will be transferred by the movement of the oil into the heater’s metal fins. This will create even surface temperatures. When the metal of the fins begins to heat, it will start to radiate out heat around your room. The heat will begin to circulate through your room thanks to the air’s natural convection. Diathermic oil has 2 properties which make it ideal as a heat reservoir. It has a high specific heat capacity and it also has a high boiling point. This means that the diathermic oil in the heater stores plenty of heat yet won’t boil the oil. When the liquid boils it will become a vapor and this means a high-pressure system will be needed to contain that additional volume. Since diathermic oil doesn’t reach a boiling point there is no need for this additional engineering complication. As the oil also has a high heat capacity, it will continue to radiate heat even when the electricity is switched off. Therefore, your heater won’t need to run for so long and you will still save on your energy bills. The oil heater’s body is composed of a set of stacked columns or fins made from metal. Sometimes, there will be one metal flat panel, although this is more unusual. The diathermic oil will circulate through the channels which are inside those panels and fins and it will heat up the metal during that process. The metal surface will heat up and radiate heat to the air which surrounds the heater. If the heater has a bigger surface area, it will have more contact with the surrounding air. This, in turn, will allow the air to warm up more quickly. Some people complain that oil heaters are slow when it comes to warming up. Therefore, a number of manufacturers have worked to solve this problem by putting several fins together to radiate the heat more effectively. You shouldn’t confuse heater size or surface area with how much heat the heater can produce. The heat output will be entirely determined by how much electricity is consumed. This will be measured in Watts. The amount of surface area will only affect the speed at which the heat produced will be spread around the room. Oil heaters operate silently, which is another reason why they’re so popular. Most models have no inbuilt fan. Instead, natural air convection is responsible for circulating the produced heat around your room. When a gas or liquid achieves a higher temperature, it will become less dense. It will then rise upward. The air will rise up to the ceiling which will then push cooler air towards the floor. The cool air will be warmed up by the oil heater and this means a continuous current will be created through the room. With time, the current creates even temperatures through the room. Energy efficiency – all the energy used by an oil heater will be directly converted to heart. This means you’ll save money on your bills, especially since oil heaters don’t need additional power to operate a fan. Slow cooling – since oil heaters radiate heat after switching off the power they are even more energy efficient. Thermostat controlled – after the room has reached the right temperature, the heater will continue to cycle on and off maintaining the optimal heat rather than running continuously. This will ensure your room stays at a comfortable temperature while saving money. No need to replenish oil – since the oil will never be used up as a fuel it will never need replacing. Portable and compact – thanks to their compact and lightweight design they can easily be moved from room to room. Safety – although the metal surface will warm up, it will never be so hot it burns you by accident. Also, as no fumes or gas are produced they can be used safely indoors. Most models also have safety features built in which switch off the heater in the event of a fault for your protection. Hopefully, now you’ll be able to make a decision about whether one of these heaters could be the perfect answer to your chilly rooms! Follow us on Facebook and Pinterest to see loads more articles like this on a regular basis!